I love a goody bag. It's actually been a while since I had my hands on a really good one too - putting a free newspaper and an information leaflet about IT services in bags for my Student Union's freshers' fair even threatened to put me off them for life. Fortunately, yesterday brought me a bountiful goody bag as just one small part of an inspiring free event. The Forward Women day was for young women, featuring talks and panel discussions, to give us a kick-start in our careers. It was at Kings Place in London, where The Guardian and The Observer have some of their offices. I mainly signed up for the day because I loved Secrets of China, a programme presented by guest keynote speaker Billie JD Porter. But the whole day was packed with inspiring women, both on the stage and amongst the attendees. The novelist Samantha Shannon, Vlogger Lily Prebbles, and DJ Gemma Cairn were just a few of the speakers. It's not often that you get to be surrounded by just women, thinking about the best ways to achieve what you want from life. It was such a great event, and was completely free! If it runs again next year, I'd definitely recommend going. But on to the bag. And I must warn you, some of these freebies really are peak Guardian. Tote bag - bearing Beyonce's feminist war-cry, this bag is both functional and political. I heard a lot of the young women I was talking to praise the bags, which I'm sure will all be thoroughly reused. The Guardian - perfect for reading on the train home. Changing My Mind by Zadie Smith - this I brought myself, as I'm currently working on some coursework, as you might know if you're following me on Instagram. Smith's essays are so varied, it's difficult to pick out one to recommend, but I do particularly love 'Find Your Beach' (which isn't included in a printed edition, but which you can read on The New York Review of Books here) and would recommend that as an introduction if you're interested. Proper Corn - another goodie. I feel like I'm rediscovering popcorn at the moment, fortunately so is the food industry. I'm eating this bag of Smooth peanut and almond corn right now. It basically tastes like popcorn and peanut butter, so seek it out if that sounds good to you. Power Bank - this was a present a few years ago but I've literally just worked out how to use it. Aptly timed, as a day in London, especially when I'm live-tweeting an event (shoutout again to the Forward Women day for providing us with free WiFi!) is a sure way to run down my battery. Guardian reusable coffee cup - because using a reusable coffee cup wasn't smug enough before. Sibberi birch water - this honestly made me laugh. Peak Guardian indeed. What on earth is it? I have yet to try it, and quite want to hold off until I can share it with someone else. It may well be lovely. Faith in Nature coconut shower gel - I love the smell of coconut. Apparently this can also be used as a foam bath, which I may try at some point. It's very rare that I get the time for a relaxing bath. Free pens - One is from RBS, who sponsored the day, and whose prominent female staff featured in the talks and panels. The other two are from City University London, which I rushed off to after Forward Women to attend an open evening. All in all, a very busy and exciting day! 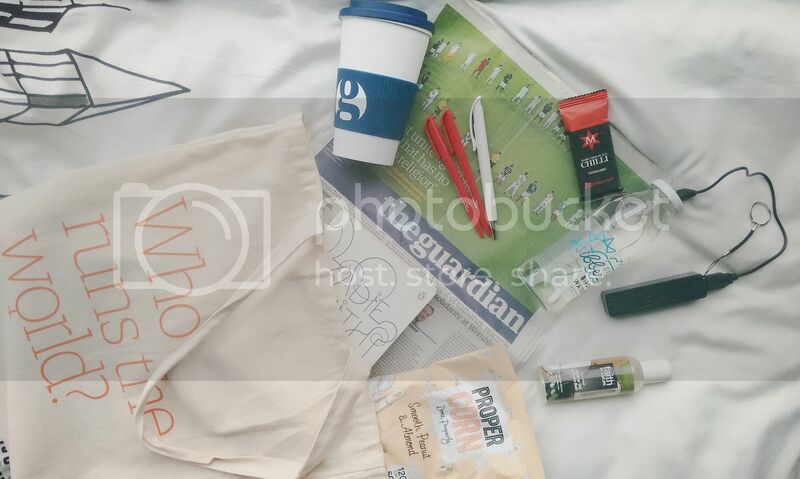 Labels: Event, goodie bag, newspapers, the guardian, What's in my bag?